Here’s an interesting bit of investing trivia: had an investor picked up shares of The Buckle (BKE) – a midscale casual apparel retailer – at the company’s 2008 low, the shareholder would now have received the entire amount of their original contribution back in the form of dividends. Think about that – in just under 6 years your capital risk would effectively be zeroed out because all of your cash would in back “in your pocket.” Furthermore, shares are now worth nearly 3 times as much today as they were back then. Of course you can’t invest in the past, but we do believe that this example depicts an interesting illustration. If you were to glance at The Buckle presently, it doesn’t seem like there’s much income to be had from this particular security. The current yield is only 1.9% (paying out just about a fourth of its profits) and the company has only been making payments since 2003. Moreover, it doesn’t even make the list of Dividend Challengers – a 5-year dividend increase list compiled by fellow contributor David Fish – because The Buckle’s regular payout was frozen at $0.80 from 2009 to 2012. 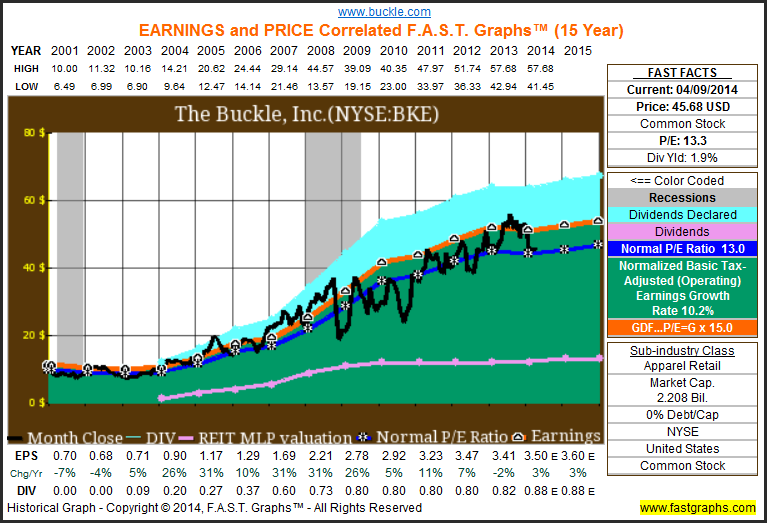 Yet what is not readily apparent is The Buckle’s use of the special dividend. On a regular basis the company doesn’t buy back shares or issue debt – common shares outstanding are at the same level as they were in 1999 and the company has no long-term debt. 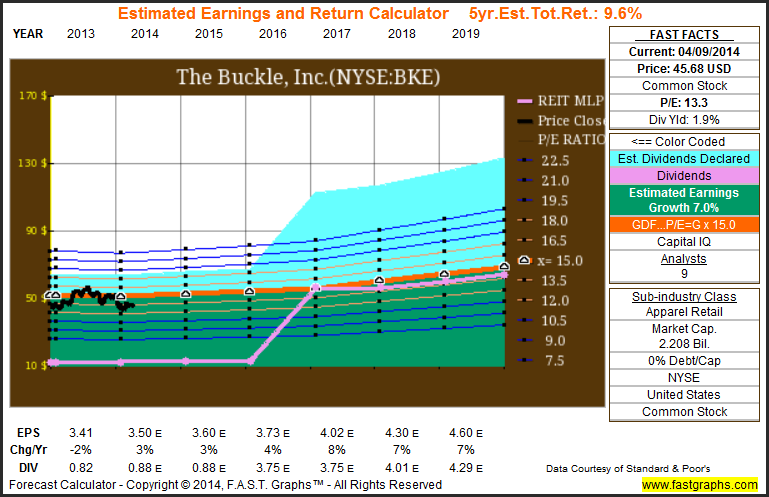 What The Buckle has been doing is routinely providing a yearly income bonus in the form of an extra dividend. According to the company’s website The Buckle paid special dividends of $2, $1.80, $2.50, $2.25, $4.50 and $1.20 in the fiscal year periods of 2008 through 2013. In other words, this company has paid a “special” dividend in each of the last 6 fiscal years – collectively to the tune of 3 times the normal dividend. To us, this model is somewhat reminiscent of how you might run a successful private business. You pay yourself a modest salary throughout the year, keeping the majority of the cash flow for the business. Then, at the end of the year, you realize you don’t need all of the retained cash for the business. So you give yourself a hefty bonus, which is often in excess or even multiples of your wages for the year. Furthermore, it seems kind of impressive that the company can grow – basic EPS went from $0.70 in 2001 to today’s mark of $3.41 – without retaining much of its earnings, issuing debt or buying back shares. More specifically, historically the business model has been sustainable enough to grow in its own right – by roughly 10% per annum – without the need for consistent large capital infusions. Ironically, despite its recent and now storied dividend record, it seems that The Buckle management doesn’t give much of a hoot about dividend increase streaks. Instead of issuing large special dividends each year, the board could have easily raised the dividend by some small amount and would now be sitting on a 10-year increase streak. Yet management has taken a unique route – with the total dividends paid ranging from $2.60 up to $5.30 and back down to $2.02 in the last year. As a consequence, a security like this could pass under your radar – despite its hefty income tilt. With that, let’s take a graphical look at historical performance of The Buckle utilizing the fundamentals analyzer software tool of F.A.S.T. Graphs. Here, as described, we can see that The Buckle has been quite consistent – growing at about 10% per year with just 3 single digit down years in that last 13. Notice that the regular dividend has been consistent – although frozen for a time – while the special dividends are not displayed in this format. Additionally, shares have generally traded at P/E ratio of about 13 historically, which is more or less in line with how it trades today. But as we know, past returns are not necessarily indicative of future endeavors. So this graph has told us that The Buckle business model has been working, the company has been quite consistent and the dividend has been well covered. Expressed in a slightly different way, The Buckle is a leading retailer of medium to better-priced casual apparel, footwear and accessories with its own brand and partnerships with well-known companies like Fossil, Hurley, Nike, Oakley and Puma. As such, the company has grown from 387 stores in 2009 to today’s 450 mark – all while increasing sales per square foot at a reasonable pace. To get an idea of what the company’s prospects might look like on a forward basis, the Estimated Earnings and Return Calculator can provide some insight. Presently analysts come to a consensus long-term growth rate estimate of 7% – with the next couple years of estimates demonstrating slightly slower growth. Interestingly, even the median estimates forecast some type of “special” dividends in the future. Granted this can be quite difficult to predict, but nonetheless demonstrates how consistent these additional payouts have been. If you look at the factors collectively, the estimates materialize as forecast and The Buckle trades at a 15 multiple this would indicate a total return of roughly 10% over the intermediate-term. Now, it’s paramount to underscore the idea that this is simply a calculator defaulting to analysts’ estimates. However, it does provided a reasonable baseline for how they are presently viewing this company. In the case of “special” dividends the projections can be especially unpredictable, but it should be noted that a F.A.S.T. Graphs’ subscriber has the ability to change these estimates based upon their own opinion or scenario analysis. In checking with other sources, the next few years of estimates appear more or less reasonable. In turn, one might think through the special dividend in the following way. First and foremost, the company is expected to earn about $3.50 in the next year – you should first complete your due diligence to feel comfortable with this number. If comfortable, you could move on to the next steps. So basically we view this company in the following way: a 1.9% current yield, the ability to grow at a modest pace and an “option” or possibility of future additional income that might bump up one’s yield to the 4-6% range over longer time periods. Of course, that can be true with any company, but this one in particular has developed a pattern of paying out the majority of its profits rather than retaining them or buying back shares. Of course that’s not to suggest that the company is without risks. For instance, in the opening we told you that The Buckle had paid more in dividends than it cost for a share during its November 2008 share price low. Well, also during this time The Buckle paid slightly more out in dividends than it made in profits. Granted this was largely due to a massive special dividend in 2012, but clearly it would be unsustainable in the long-term. Thus future payments might be a bit smaller. For that matter, payments are generally going to be more lumpy or worse. And of course there’s always the possibility that the company’s profit model falls through and goes to the wayside as so many other retailers have. With equity partnerships there’s always the risk of failing to execute. Overall we have found The Buckle to be a strong and historically growing company. This is in conjunction with a rather unique way of distributing the ownership spoils. In the past this has proven to be an exceptional income stream for long-term partners. Whether or not this will persist into the future is anyone’s guess, but we at least know that the company has a propensity to continue down this distinctive path. Today shares trade in line with its average historical valuation. In turn, The Buckle appears to have reasonable growth opportunities and a well-covered regular dividend – with the possibility for consistent yet potentially irregular income boosts. However, as always, we recommend that the reader conduct his or her own thorough due diligence. This entry was posted in FAST Graphs At-A-Glance and tagged BKE. Bookmark the permalink. ← Johnson Controls: Back To Consistency?